Mr. Whimsey and I love to travel. Most of the time, we want to take our kids with us. So far, they have wanted to come along (knocking on wood). Over the last fifteen years, we’ve had many incredible travel experiences as a family. What I’ve come to realize as a traveling mom is that really great vacations rarely happen on their own. They are created with deliberate effort. Listed below are the essential ingredients I believe are necessary for parental sanity and memorable vacations regardless of the age of your child. 1. Know your child (or children). Personality, stage of development, interests and anti-interests – they all play a part in determining destination and itinerary. Toddlers who scream bloody murder if they are in a car seat for more than five minutes probably shouldn’t be taken on a cross-country road trip. Likewise, teenagers who do not become human until noon should not be forced into daily crack-of-dawn activities. Everyone suffers in these situations. Unless you are one of those sadomasochists. Which I’m guessing most of us are not. No. Wait. Aren’t all parents sadomasochists? Now I’m confused. 2. Plan accordingly. Use your almost supernatural knowledge of your children to plan trips the whole clan will enjoy. Perhaps an illustration is appropriate at this time. I have three kids – daughter (15), son (12 1/2), son (10). As you can imagine, personalities and interests run the spectrum and planning trips can be tricky. We would like to head to Gettysburg for the weekend next summer. For the youngest son, the battlefield is a must-see. To make it more enjoyable for the first son, we’ll probably ride bikes instead of driving. The daughter would gladly endure all of this if there is the reward of a ghost tour in town at the end of the day. In this scenario, everyone gets to do something that really interests them, as well as practice a bit of self-sacrifice, a necessary life skill in successful relationships. 3. Ask for input. As your kids get older, they’ll have opinions about where they would like to go and what they would like to do. Listen to them. Then do the research and figure out if it can happen. Realistically, not everything the little people in your family suggest will be feasible or desirable. It’s OK to explain to them why the moon or the Disney Wonder are not possibilities. Then work together to come up with satisfactory alternatives. Getting the kids involved in vacation planning from the beginning pretty much ensures enthusiasm about and active participation in the experience. 5. Remember who’s the boss. (Hint: It shouldn’t be your children). Just because you are on vacation doesn’t mean that the responsibilities of parenting go on hiatus. As a matter of fact, the unique factors that make a vacation what it is might require even more parental diligence than normal. It’s OK to relax the rules on some things like bedtime or the amount of junk food allowed in a day. However, ignoring disobedience, mistreatment of family members, disrespect, and all-around rotten behavior is just asking for misery. Yes, sometimes this means you will suffer the consequences right along with your little monster angel – I hate that about parenting. However, if you have any hope whatsoever of a pleasant travel experience, you have to be willing to play the heavy. 6. Allow age-appropriate independence whenever possible. This can be as simple as letting your toddler out of the stroller or back carrier to run around. Take younger kids to a playground and let them run around while you read a book or just relax. Older kids can go to the hotel pool, walk the boardwalk, or tour an amusement park on their own. 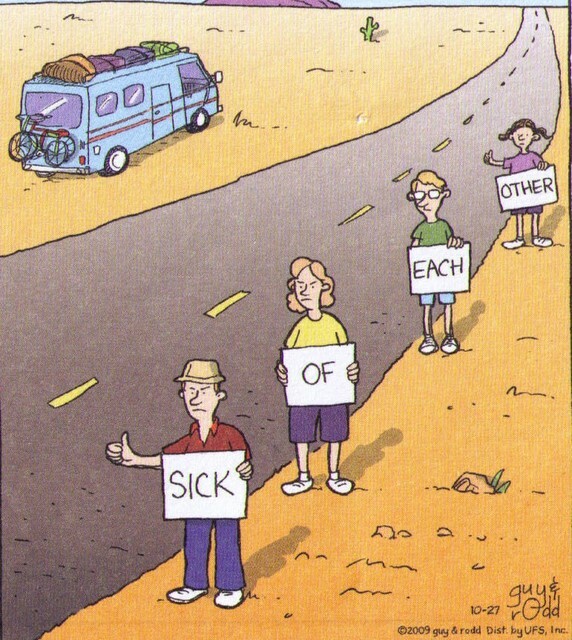 Trust me, 100% togetherness does not make for the best travel experiences. Allow for some breathing room or you’ll end up hating each other. 7. Schedule down time. It is so tempting when you travel to someplace new and exciting to go into overdrive attempting to “do it all”. Don’t. You’ll be headed for burnout. Remember, no matter how exciting your vacation experience is, your little kids really just want to be back at the hotel or rental unit, swimming in the pool. And completely depriving older kids of time to maintain their social connections will result in a full-blown vacation strike. Always plan for some time to just hang out and relax. Isn’t that part of the reason we take vacations anyway? 8. Be as flexible as possible. When it comes to travel, planning is essential. I, for one, probably fall into the uber-planner category. I’m OK with that and so is most of my family – both nuclear and extended – because they’ve reaped the benefits of my obsession. I am here to testify that no amount of planning covers every possible scenario. Things happen. It rains. People get sick. Rides break down. Having a flexible schedule and attitude can go a very long way toward thwarting disappointment and tears. Believe it or not, planning allows for more flexibility because Plan B’s are easier to pull out of your hat when you know what’s available. 9. Give kids opportunities to earn spending money. My hubby and I are not big souvenir purchasers, mainly because I don’t want to spend my travel time shopping. My kids like to buy things, though. We’ve discovered that they make fewer and better buys when they use their own money. It’s quite funny how discriminating they become when it’s their own money they have to part with. And, it completely takes the pressure off the parents to approve or veto an item since it’s not our hard-earned cash flying out the window on the wings of junk. 10. If all else fails, go to a science museum. These gems offer a wide variety of exhibits that are sure to satisfy the interests of almost everyone in the family. The exhibits are very hands-on and kid friendly. In these museums, kids are expected to meander and touch. Often, IMAX theaters with great movies are connected to the museums as well. The bonus – your children might actually learn something in the midst of playtime (gasp!). My daughter, whose fifteenth birthday is just around the corner, still requests a visit to a local science museum whenever we travel. Family travel is a delicate balance between scheduled togetherness and independent relaxation, between doing what we love and allowing others to do what they love. It’s about spending time with the most meaningful people in our lives and making memories to talk and laugh about for years to come. Using the above tips will help lay the groundwork for the best experiences. The rest is up to you. Have a great trip! Oh, and if you have any tips, please share….